Who Moved My Barn Door? 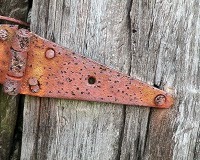 I really need to stop it with the "Barn Door" titles. So I now have wired a Raspberry Pi to a garage door remote, created a primitive web interface for it, and attempted some security and stabilization for the supporting applications. Now I am moving on to sending an e-mail with photo attachments of security events that have occurred. Setting up the mail server within the Ubuntu distribution was a bit of a pain. The Pi can't act as an MTA all on its own thanks to all the relay rules in place across the Interwebs, so instead I had the default exim4 installation route through GMail. I wasn't interested in installing yet another outbound mail system; I would rather leverage what comes packaged by default. I ensured I deployed an application-specific password for exim4, then followed the very helpful instructions from Debian on how to hook it all up with GMail as the outbound SMTP relay. Once combined with Motion's External Commands, I can build scripts that e-mail off movie files as soon as they end. The mpeg4 format appears to work natively within Android, so video snippets are easy to view once they are e-mailed out. Now for some polish; I need to construct/find an enclosure and finish the front-end user interface. 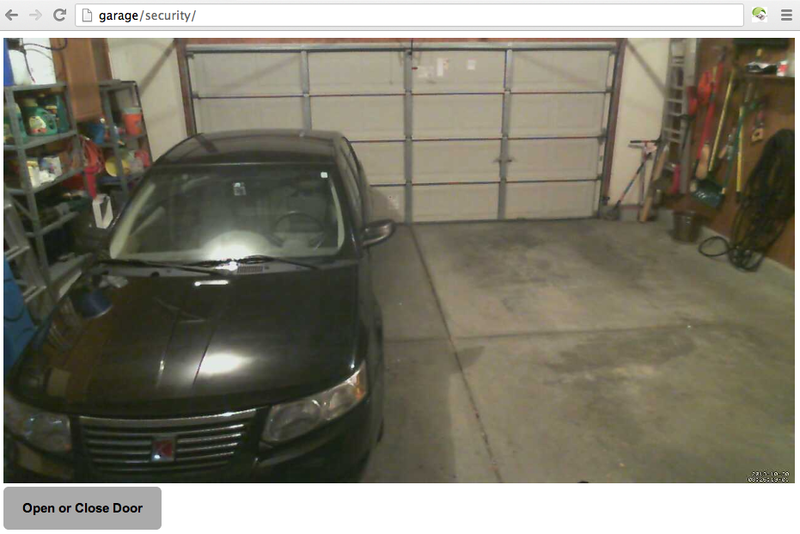 After I buttressed the Pi as best as I could, I constructed a simple webapp to allow users to view the security cam feed and activate the button on the garage remote. It was surprisingly straight-forward to render an MJPEG feed on an HTML5 canvas, but it took a bit more doings to expose GPIO as a minimal REST call. One big condition I held was that the webapp should not be granted root access, even if it was indirect access with a setuid script. 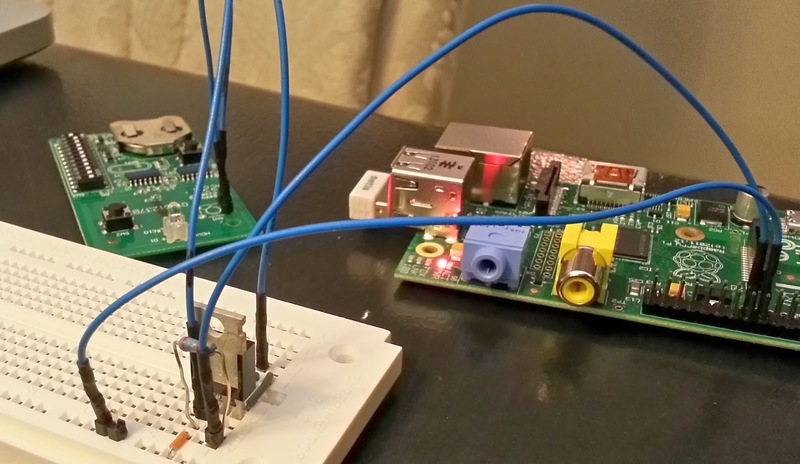 The WiringPi utilities allow one to create GPIO devices handles that can be accessed by an unprivileged user such as www-data. By adding an entry within /etc/rc.local for the WiringPi utility the devices will be created on boot for use by a user within the gpio group. The WiringPi Python libraries then use these devices to control the GPIO pins. This took a few hours of experimentation, and a huge amount of thanks go to Sebastian Österlund's WiringPi post for helping me figure this out. One could use a REST framework such as WebIOPi to expose GPIO access over a REST interface, but it looked like this implementation needed privilaged access and the webapp didn't require 99% of the features that WebIOPi ships with. Instead, I leveraged Bottle to expose the WiringPi library as a REST call, which permits a client-side application to issue a remote call and active the garage door remote. I know I'm definitely not early to the garage door hacking scene - there are several other projects using Arduino with mobile front-ends, some adapted to use the Raspberry Pi with relays, others with wireless interfaces and mobile webapps. I'm a bit partial to this approach because it has a fairly low part count (one resistor, one MOSFET, some wire, a mini breadboard, one universal garage door remote, a cheap webcam and a Raspberry Pi), it doesn't use relays and the web application does not require privilaged access to low-level resources. Feel free to check out the evolving webapp - it is now managed under GitHub at http://github.com/deckerego/GarageSecurity/. I will continue tweaking it a bit and eventually fitting it with some sort of user interface, but I also want to move along and use Motion's External Commands to e-mail me whenever it detects motion. Unfortunately HP's HD-3110 has an auto-focus that keeps kicking on and registering as a motion event, so I might dig deeper to see how to disable the feature. Of course I still need an enclosure as well... right now bare wire and board are just sitting out on a shelf. One stray squirt gun and all is lost. I was a bit hasty when I said the next step in building the garage door security camera was constructing a web interface. As any good DevOps guy should know, getting the administrative portions of the host in stable shape is really the next step. I needed to deal with disk space issues, data retention, security and properly setting timezones. The timezone issue is more a matter of personal taste. I would rather the time on the server reflect local time, since I will be looking at file timestamps quite frequently. Others may fall in love with UTC. Or Swatch Internet time. Whatever floats your boat. I did notice that tzselect does not appear to persist across reboots; instead I had to use dpkg-reconfigure tzdata. The primary goal was to secure access to the webcam feed and disallow unauthorized access. Since this is an Ubuntu distribution, I used the Uncomplicated Firewall to only permit traffic across HTTP and SSH ports. This would close the default webcam and control ports that could be exposed by Motion, as well as other running services. The control endpoints were not needed for my purposes, and I'd rather not assume the risk of arbitrary file access. I still wanted to have access to the MJPEG feed coming from Motion... however I wanted the ability to lock it down. In order to provide more granular security controls I proxed the 8081 webcam port from Motion behind Apache2's mod_proxy, where I could define whatever controls I liked within the Apache VirtualHost. Likewise I allowed authenticated users to view the list of recordings using Apache's directory index module so that archived images and recordings could be easily accessed. Once Motion was appropriately locked down, I moved on to dealing with file storage and archival. Instead of writing to the local SD card, I decided to make an NFS4 mount to a NAS server on the LAN. The amount of file I/O could easily be delt with over 802.11n, and the SAN could also assume the duties of archiving/compressing the files on a daily basis. This keeps the number of files on the mount much lower, allows for greater storage and doesn't wear out the SD card nearly as much. One catch was that the mount was occurring over a wireless interface, so an attempt to mount the filesystem too early would cause the boot process to lock up. I worked around this by using the mount options soft,bg,timeo=14,intr to decrease the operation timeout and allow for retries in the background. By the time the boot processes is complete, a retry operation should be able to successfully mount the drive. The final security point is one that will be of much greater use once the web interface is written. The RPi.GPIO libraries write to /dev/mem, which means they need root access to work. Rather than grant scripts root access to /dev/mem (which is horrible practice), I enlisted the help of Gordon Henderson's WiringPi project. There are two parts to this implementation: one is the GPIO utility that helps create userspace devices for GPIO control, and the other is the Python library that can access these devices. I created an entry in rc.local that creates a device for GPIO17 in output mode that is accessible by www-data, which in turn can be accessed within a Python script running as the www-data user. The security is definitely not exhaustive, but it's a solid start to get things rolling. From here I should be able to deploy a web application that exists as the sole entry point for the garage security system, and access controls can be entirely managed through Apache. A rogue user should hopefully be contained within the scope of the www-data user. 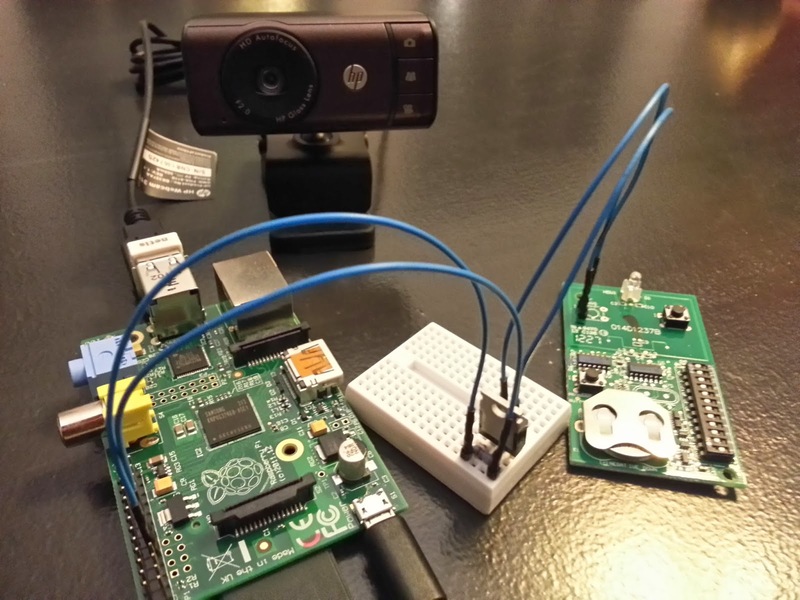 I added the security camera functionality to the Raspberry Pi I've been working on, using an inexpensive HP Webcam HD-3110 and the Motion subsystem. Both worked out of the box using the Raspberry Pi and the default (but upgraded to latest) NOOBS installation. Neither had an issue, and I was up and running with a security camera quickly. Another nice thing about Motion is that it exposes several external commands as a means to provide API exposure... so I can integrate a web application or send an e-mail at the start of an event. It would be great to send an e-mail whenever motion is detected, and send the video or photos related to the event. Once the security camera was working and stable, I added back in the GPIO garage door opener remote that I hacked together. Working together, I now have a security system for the garage that can open and close the garage door from any vantage point. I deployed it up on a shelf, next to the windshield wiper fluid, where the webcam would have a nice perch. I whipped together a quick Python script that would briefly engage the GPIO pin on the Raspberry Pi, so now I can sit at my laptop and watch the garage door go up and down. Ultimately I will place this feature behind a web application for ease of use. 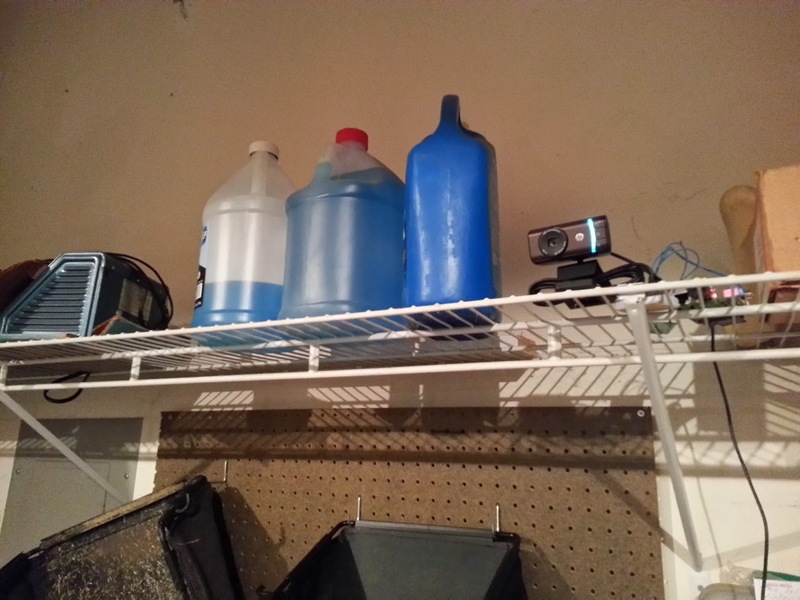 The Python support for Raspberry Pi seems to be a first-class citizen, so I might use Bottle to create a minimalist webapp for exposing the webcam feed and garage door controls. I still need to build an enclosure... and perhaps upgrade the camera to one without an infrared filter and an array of IR LEDs. The web interface will be the next thing on the docket however. One compulsive behavior I can't seem to shake is the fear that I have left the garage door open. I count the squares on the front, I measure the light and shadows, I obsess. To tell the truth, even if I had a magic device that would send me a message every time the garage door opened or shut, I wouldn't trust it. I have to see it. 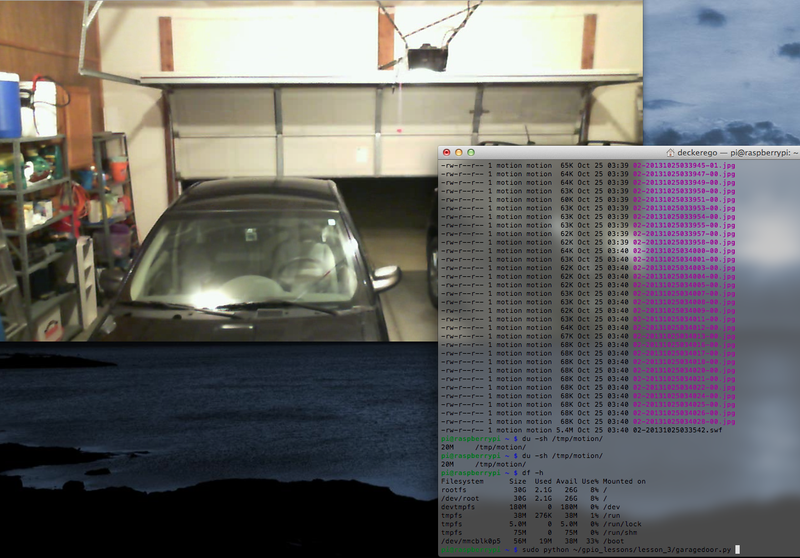 To feed my neurosis, I began working on a combo surveillance camera / garage door controller with an Internet interface. The first thing I attempted to get working was the method of opening the garage door; up to this point it seems like most efforts have been using a relay to close the switch of the hard-wired "big button" for the garage door opener. I wanted to have the freedom to place the device anywhere I wish, not unlike the garage door keypad that comes with most openers now. A spare Chamberlain universal remote was just sitting in my garage, so I decided to shuck it and rip out the logic board within. The board actually had a fairly nice layout and a hidden third button. I only needed one button... and a way to trigger it without a physical press. Using a complicated tool called a "screwdriver-like thingee" I pried the physical button off, leaving nothing but the leads behind. Instead of sharp metal prongs, I got the ole' trusty soldering iron out and melted the solder enough to pull the leads out. I replaced two of the leads with pins for easy breadboarding. I have a weird affinity towards MOSFETs. I'm not entirely sure why. I have a feeling that my affinity to using a MOSFET instead of a relay is similar to most people's opinions on using an Arduino instead of a Raspberry Pi. With such snobbery in mind, I prototyped out a circuit that would use an N-channel MOSFET to close the circuit instead of a switch. Bear in mind I paid no attention in 6.002x, so my circuit has less to do with elegance and common sense as it did with "let's slap together a MOSFET and pull down resistor." Still, sending the 2.2V from a GPIO pin into the MOSFET's gate pin allows the circuit to close on the garage door opener, sending the door up and down. Next up is adding a surveillance to the Raspberry Pi using a USB camera I found lying around. The plan is to try out the Motion subsystem, then adapt things as needed. One particular enhancement I'm keeping my eye on is the Raspberry Pi Infrared Camera, which I might pair with a set of IR LED's and a fisheye lens. Doing so may require some patching of Motion, but should otherwise be straightforward.